It's the anniversary of 9/11 and although there are deals keeping me busy, it also feels inappropriate to treat it as a normal business day. 5 years ago, I was working as an associate at an investment bank on the 25th floor of 800 3rd Avenue in Manhattan when the World Trade Center was struck. When we first heard of the attack, we rushed to the trading floor to watch the news. 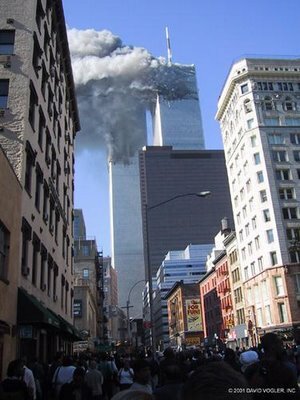 As we stood staring at the news screens, horrified at the smoke billowing from the hole in the first tower, the second tower was hit. A few minutes after that, we were ordered to evacuate. This is photo is pretty much what the street outside my offices looked like. With memorials taking place around the country, the images shared and stories being told, I'm brought right back to that horrible day. It feels like it happened yesterday. When the George Washington Bridge eventually re-opened to traffic, I went to New Jersey to be with friends. We huddled together, comforting each other, fighting overloaded phone networks to call friends and family checking and assuring each other that we were safe. Of course 3,000 people, including a personal friend of mine weren't safe at all. They perished in the attacks. Today has been a day of reflection, for remembering those we've lost and thinking about how our lives have changed. As I felt on that day, I am reminded of what's important in life and I am deeply grateful for my family and friends. Image: David Vogler, Image #2687, The September 11 Digital Archive, 1 November 2004. Yes, it's a weird day, isn't it? I think about days like today when we are off work celebrating Columbus. Who gives a crap? Let's remember something people REALLY care about. Take care!